We went for a brunch here. The food is standard and like I said, the main attraction of eating here is simply for the relatively interesting surroundings in which you eat. It is a little pricey for what it is, to be completely honest. The service started out great, but gradually deteriorated as the meal went on. It seemed to take longer than usual for each course to be served up, and it took forever just to get the bill. We started off with a green salad and some fruit salad. The green salad was okay, a little oily by my standards. The fruit salad was fine – that’s sort of difficult to do badly on. 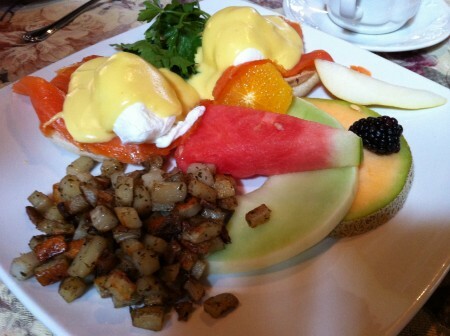 We had an order of eggs benedict with smoked salmon and another with prosciutto, several orders of the poached salmon with braised mini-leeks and gribiche sauce, and an order of the omelette of the day which was with asparagus. All of it was ordinary – not anything you couldn’t get anywhere else for better and for cheaper. Tags: Asparagus, Breakfast, Brunch, Eggs Benedict, French, Fruit Salad, Lunch, Montreal, Old Style, Omelette, Poached, Potatoes, Prosciutto, Salad, Salmon, Smoked Salmon, Vieux-Montreal.